Join Durante Rentals and New York Takeuchi October 1st & 2nd at the 2014 Build Expo in NYC! The 2014 Build Expo is coming back to New York at the Jacob Javitz Convention Center. This year, Durante Rentals and New York Takeuchi are proud to announce that we will be a featured vendor at the show. New York Tekeuchi is a subdivision of Durante Rentals and will be showcasing our exciting line of excavators, skid steers, wheel and track loaders. Durante Rentals will also be featuring the latest models of equipment and tools like rock splitters, rivet busters, cut-off saws, diamond blades and air tools, just to name a few. You can't miss our booth (#102) as we'll be featured, front and center, right as you enter the convention center's main room. Stop in for FREE prizes and giveaways! Register using the "Register Now" link or email Adam Zunic for your FREE tickets. Hope to see you there! The nation's premier building and construction show. Nowadays, we see Infrared heaters just about everywhere. Restaurants use them to keep food warm, public outdoor seating areas use them to keep people cozy and construction sites utilize them during the cold winter months to keep workers and equipment functioning optimally. As you can see, the versatility and power of infrared technology has made infrared heaters fairly common in everyday life. So how does an infrared heater work? Infrared heaters come in many different shapes, sizes and models. These heaters are composed of infrared bulbs that emanate infrared light rays. Infrared light is an invisible light wave that penetrates the object and safely heats it by using its radiation. The emission of this heat causes anything coming in contact with the rays to rise in temperature. They disperse the air evenly in the area around them as opposed to blowing hot air in one spot like conventional heaters do. Air travels through the back of the heater and through a filter. Once passed through a filter, a fan blows the filtered air through the infrared bulbs which release infrared light. Once the filtered air travels through these bulbs, it becomes heated and is dispersed through the front of the heater resulting in the heating of the area around the heater. 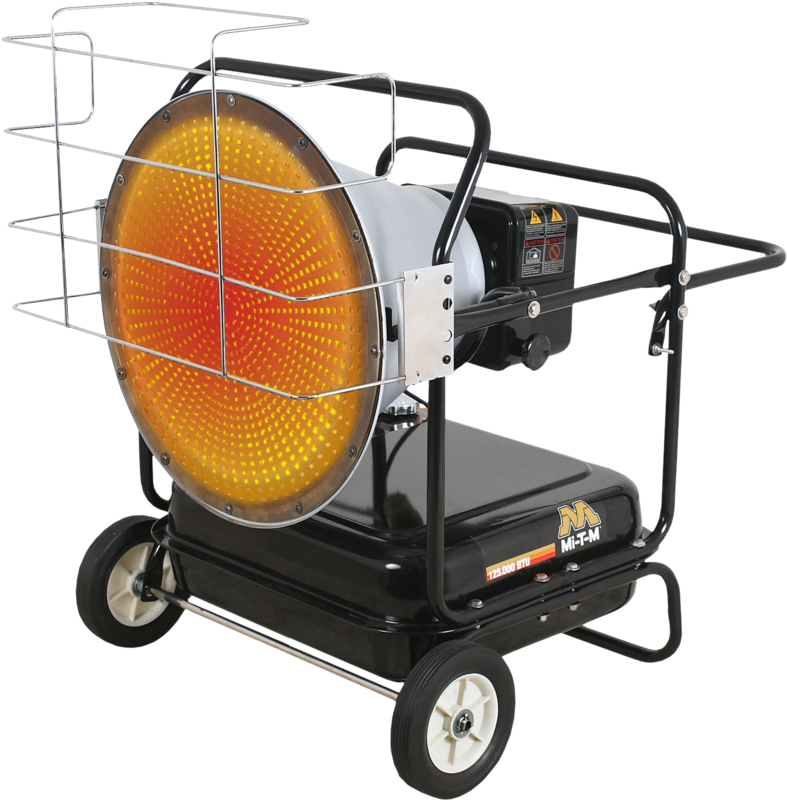 These types of heaters are best used in homes, outdoor areas, construction sites or wherever an area needs to be heated. Other types of infrared heaters include spot heaters, which are infrared light bulbs that target an object to heat it. These heaters are popular because the infrared light coming from the bulb penetrates the object and heats it from within, rather than hot air being blown at it. In addition, infrared light travels in a straight line so if it’s being used outdoors, it cannot be diverted by other sources of air. As a safety precaution, if you’re using an electric model, it’s advised that you do not plug more than one heater in the power source. If you’re using a diesel model, be sure to use diesel and not gasoline or you may damage the machine and create a potentially dangerous situation. Now that you know how an infrared heater works, make sure you rent an Infrared heater from Durante Rentals today. Who Makes the Quietest Air compressor? Air compressors are versatile machines capable of handling an assortment of applications. They come in different sizes with varying levels of power. One of the biggest complaints about air compressors is the amount of sound they emit. Most compressors are typically very loud by nature which makes it both difficult and dangerous to work with them for long periods of time. Compressors vary from 40 dB to 80 dB in sound, where 60 dB is a normal and tolerable level for most people. The amount of sound a compressor makes depends on the space it’s in and what tools are being used with them. So, who makes the quietest air compressor? Though 100% zero-noise air compressors do not exist, some come with lower decibel (dB) levels which make the machines much more comfortable for the operator. We found a few brands that are well-known for their durability and power, but most importantly, their ultra-silent operation. All of these machines are oil-free, which means that they require low-maintenance, can be used in any type of weather, and are perfect for occasional use around the house, shop or job-site. • California Air Tools: This brand specializes in air compressors and air pumps with a focus on durability and performance. They also place importance on quietness which is evident with the CAT 4610A-220V and CAT 1630 models. These “quiet” air compressors produce only 60 dB by using a dual-cylinder system, instead of one cylinder, which distributes the noise equally and ensures a tolerable working environment. They are easily portable and carry almost 3,000 hours of use. • GMC: Though GM does not specialize in “quiet” air compressors, the GMC Syclone 1630 is an ultra-quiet air compressor that has become extremely popular since its debut. Reviews of these air compressors suggest that they may be the one of quietest compressors on the market operating at a tad bit below 60 dB. Size, performance and quietness – what else could you ask for in an air compressor? • Rolair: Rolair created the Rolair JC10 with noise reduction and performance in mind. Like the other air compressors mentioned, the JC610 operates at 60dB and is only 39 pounds, which is below-average for compressors of this capability. It operates at 2.3 CFM which is enough to power attachments like airbrushes or power tools. • DeWalt: The DeWalt D55140 operates at 69 dB, while not as quiet as the other units, it is still considered a low noise emission model compared to larger compressors. Weighing in at only 24 pounds, it’s the lightest machine of the four tested which makes it easy to transport. The 1-gallon tank is small but suitable for smaller jobs. The one drawback with these machines is that you often have to sacrifice power for sound. Though they’re extremely capable for smaller jobs such as powering nail guns or inflators, they may not be suitable for large contracting jobs. If you’re looking for a more powerful, industrial strength air compressor, check out our inventory of air compressors for rent and sale at DuranteRentals.com. Air Compressor Noise Tip: You can temporarily subdue the sound of your noisy air compressor using a silencer. This accessory attached to the compressor inlet and absorbs the sound waves that pass through it. Air Compressor Safety Tip: Never use compressors for breathing air as it may be contaminated (unless it’s especially meant for breathing), and always remember to handle these powerful machines with caution and protective gear. If you’d like to rent one, call Durante Rentals at 718-697-6969 and speak to one of our knowledgeable staff about your air compressor options! Welcome to the July 2014 edition of "What's New at Durante Rentals" newsletter! Take a peek inside our latest newsletter to learn more about new equipment, industry news, company milestones, our staff and more. Our very own CEO, Anthony Durante, was recently re-elected as the Vice President of the American Rental Association's (ARA) New York Chapter. Congratulations to Anthony Durante on his continued success as Vice President of ARA's New York Chapter. At Durante Rentals, we're all about our customers so when you told us you needed more 30 inch narrow scissor lifts, we listened. These 30 inch lifts are ideal for maneuvering in tight spaces both indoors and out and can fit through most standard doorways, backyard fences and alleyways. We also carry 32 inch models for all your aerial lift needs. We've just added 12 new Genie GS1930 scissor lifts to our inventory! Rent one of these new units today! We now have solar light towers available for rent! These environmentally-friendly towers require zero fuel and make almost no noise. Do your part for the environment and rent one today! stored in heavy duty batteries. For those challenging winter days and 24/7 jobs, no extra charging is needed. For operations with shorter daylight hours, an external charge connection is provided. When light is needed, the high efﬁciency LED lights switch on and off instantly. The QLTS optimize light output for the battery charge to provide quality light throughout the night. Check out the full specs here. We've added to our inventory of mixers with these easy-to-use and easy-to-transport utility mixers from Multiquip. It is available with a gasoline engine or electric motor for operator convenience and for increased versatility. It can also be used as a wheelbarrow to transport concrete, debris and other materialaround the job site. With a stronger frame and sturdy steel or polyethylene drum, the Mix-N-Go is ideal for small footings and bases, binding block and concrete patching. Rent one today for your next concrete job! Durante Rentals recently donated 100+ golf towels to the Elmsford Police Department's PBA Golf Classic, taking place on August 4th at the prestigious Knollwood Country Club. Over 100 participants are expected to show their support and play in this annual event. We have a few extras on hand so next time you're at one of our locations picking up your rental, make sure to request one while supplies last. Remember, golf etiquette dictates that your shirt be tucked in, you play the ball where it lies and your clubs always be clean! Fooooooooooooooooooooooooooooooooooooooooore! If you've had the opportunity to drive by our newest location in Elmsford, you've definitely seen our new awning. Our customers have described it as "eye-catching", "cutting-edge", "bold" and "just as cool as the giant Paul Bunyan statue across the street". With the new awning, beautiful new flowers and landscaping, large selection of new Takeuchi machines and wide-array of equipment and tools - we're 100% open for business and ready to serve the needs of our Westchester and Rockland customers. Stop in for all your equipment and tool rental needs or to simply check out the sleek new machines we have for sale as NYC's authorized Takeuchi dealer (5 Boroughs, Westchester & Rockland). Our friendly staff will make you feel right at home. Durante Rentals will be at the 2014 Build Expo taking place on October 1 & 2 at the world-renowned Jacob Javitz Convention Center in New York. The Build Expo promotes the growth of regional building and construction industry markets. Please make sure to stop by our NY Takeuchi booth located at the very entrance and check out our brand new Takeuchi line of excavators, skid steers, track loaders and wheel loaders. We'll have plenty of staff on-hand as well as free giveaways, contests, price quotes and more. We have a limited amount of free tickets available so please contactAdam Zunic if you'd like to attend. We hope to see you there! More information on the 2014 Build Expo here. As many of our valued customers already know, Durante Rentals holds season tickets to the Mets at Citifield. We try to reward our best customers with tickets from time to time and on the very rare occasion our owner, John Durante, will attend. As an avid Yankee fan, our gut feeling is that the post-game Huey Lewis and the News concert had something to do with his attendance on this particular night. Can you spot John and his beautiful wife Diane in the crowd? Hint: See the big red arrow. Check out our eBay store for a wide selection of construction related tools and equipment for sale at discounted prices. Our featured item of the week is this 2006 CAT 446B Backoe Excavator. It is currently listed at $24,995 or Best Offer. Are you a fan of light towers but don't have the budget to purchase a new one? You're in luck. This 1/25 scale model of an actual Allmand light tower will set you back a lot less than the real deal.more details here. The national group that represents U.S. architects projects that spending on non-residential buildings will continue to increase this year. However, it won't jump by as much as the American Institute of Architects had originally thought. The AIA believes such spending will jump by 4.9 percent in 2014, down from original projections of 5.8 percent at the beginning of the year. Read More. The value of contracts for future construction in the metropolitan area rose 28 percent in June compared with a year ago, as residential activity picked up. McGraw Hill Construction, an industry information service, reported that $2.7 billion in contracts for future building was awarded in June for the 23-county region that includes Long Island. Read More. New York Takeuchi, a division of Durante Rentals, is currently offering 0% financing on all new machines. Choose from popular models of skid steers, compact excavators, track loaders and wheel loaders.